What are technical features of Great Wall stone crushing plant ? NewsHome > News > What are technical features of Great Wall stone crushing plant ? Stone crushing plant are consisted of jaw crusher, cone crusher, impact crusher , roll crusher and other auxiliary equipment. 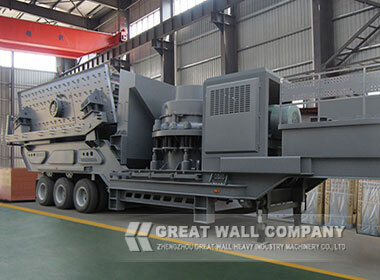 What are superb features of Great Wall stone crushing plant? As a professional manufacturer in the fields of stone production line and stone crushers, Great Wall Company has over 30 years experience and supply all kinds of solutions for different clients' requirement. Stone crusher engineers summarize the stone crushers mechanical advantages in stone production line. 1, High degree of automation,finished particle size is adjustable for stone crusher. 3, produce gravel granularity is even and the crushed grain is good shape. Next: How to select jaw crusher and cone crusher in open-pit mining?